Every once in while I find things on Pinterest and actually re-create them myself. And every once in while I have a #PinterestWin. 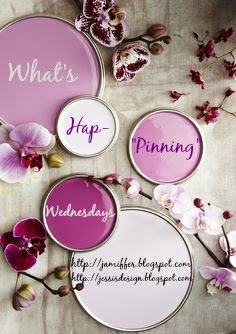 Meaning that what I created looks almost identical (or at least very similar) to the pin I placed on the corresponding Pinterest board. And I am pleased to report that that is exactly what happened this past weekend. As I mentioned in Monday's post, my bedroom has been sitting in an incomplete stage for about a year. That's what happens when you move into a new house and then 2 months later decide to book a trip to Europe that costs a few thousand dollars. Everything else in life pretty much got pushed aside until said trip was paid off. (Which I do not regret in the least. And would do all over again in a heart beat). But since I am not going to be paying for a very expensive trip over the next few months, I'm finally able to invest in my living space. And the first place I knew I wanted to tackle was my bedroom. Thus the need for these four pins. 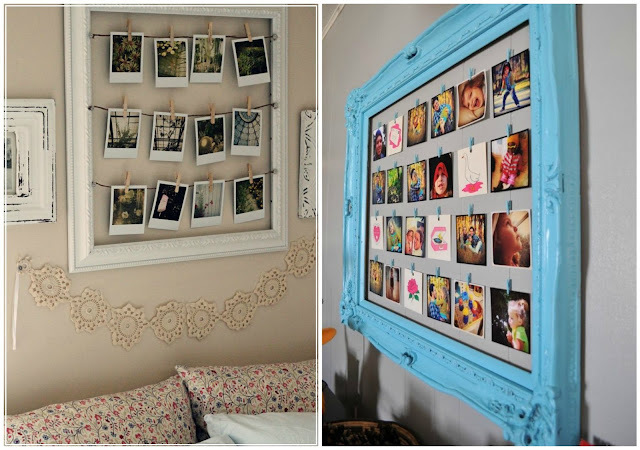 These pins have been on my "Bedroom Inspiration" board for.....well EVER. I've been wanting to do something with all my Instagram pictures for at least a year and half and I finally turned my pins into real life creations. And I could not be more in love with them. Here were the inspirations for my creations. And here is what I actually did. First I laid out my pictures in the frame to make sure I knew how many I needed and how much twine I would need. 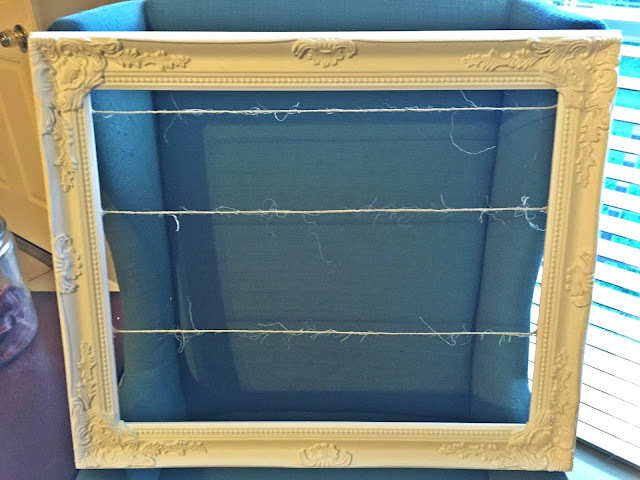 Next came attaching the twine to the frame. I just used hot glue. Which my fingers did not thank me for. I think I burned myself about 20 times. 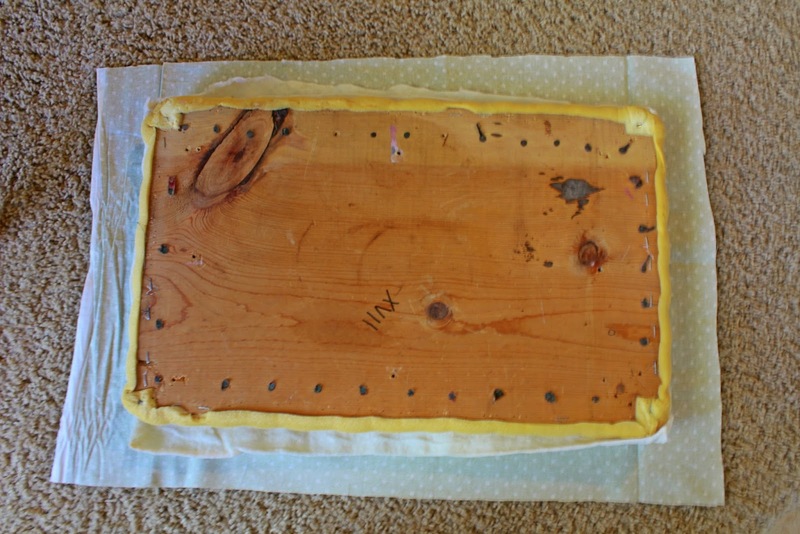 It didn't gel that I kept glueing the string crooked. I eventually got it right though. Lastly I attached the pictures using the tiny clothes pins. And WA-LA! I'm obsessed with them. And I love that I can change out the pictures whenever I want too! 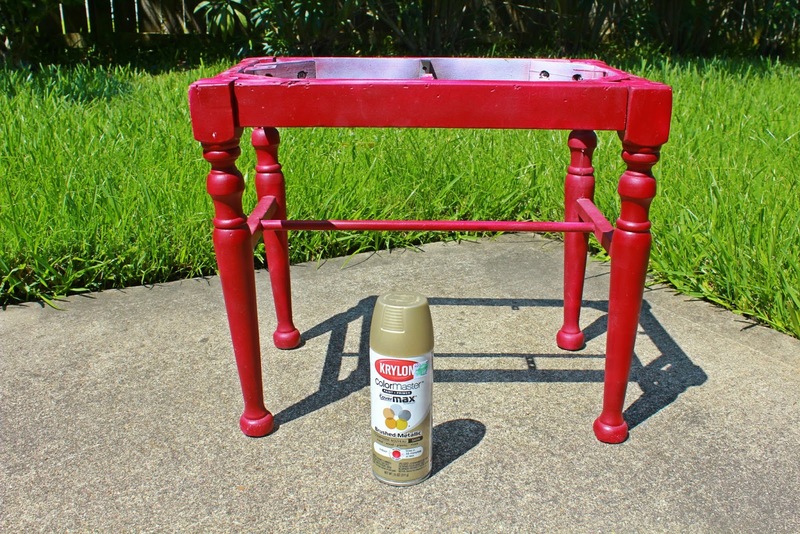 The next DIY project didn't come from Pinterest but was another project I've had on my "to-do" list for the last year. I bought this cute little stool from Good Will last August with the intention of re-painting and recovering the seat. 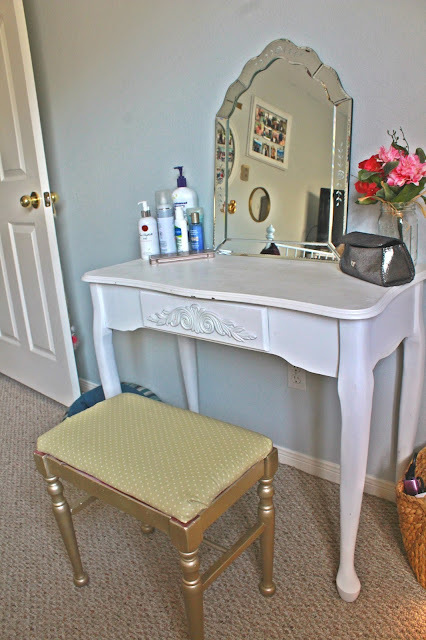 It fits perfectly under the vanity table in my bedroom. And it was super easy to do. 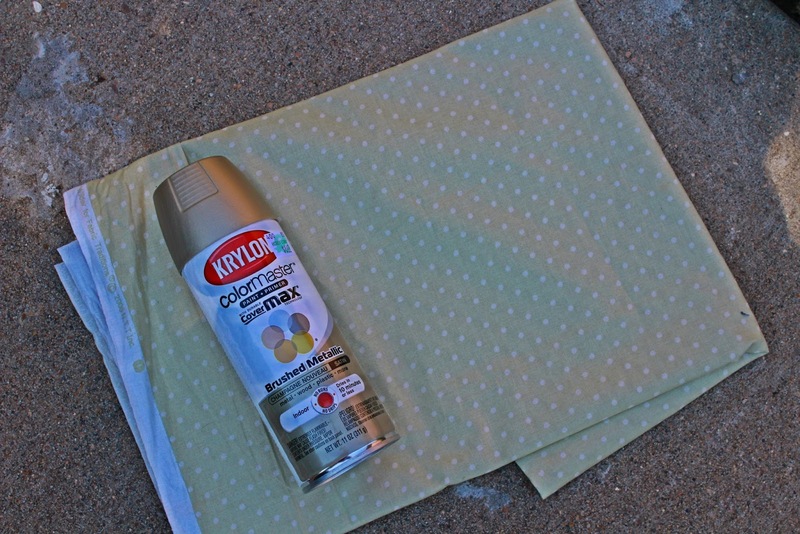 All I needed was spray paint and the fabric. 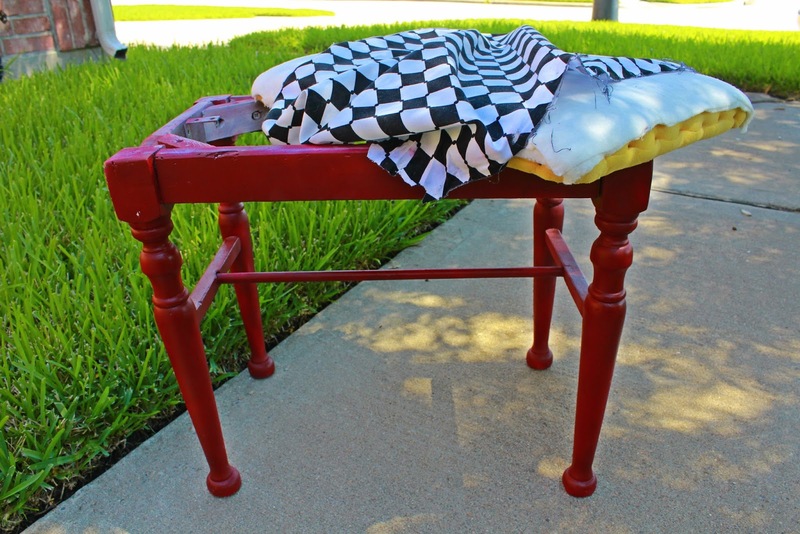 First I had to disassemble the stool and remove the old fabric from the cushion. 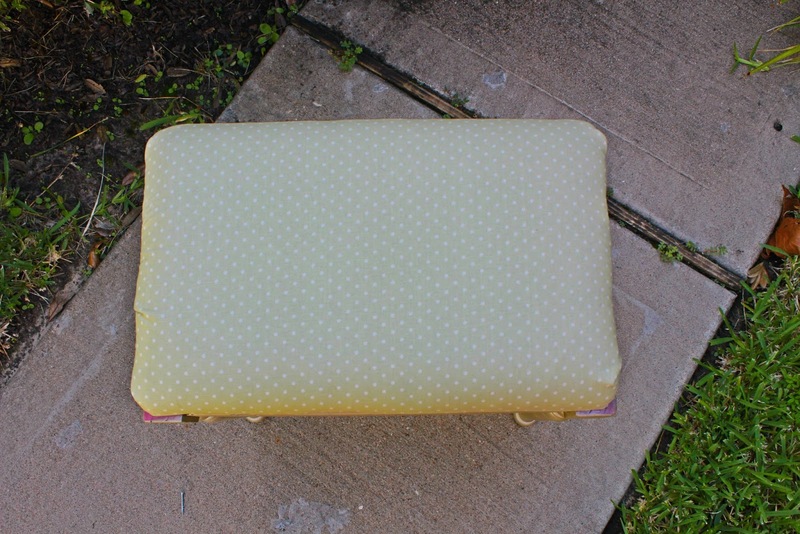 Next I cut the fabric I chose to fit the cushion and then hot glued the new fabric to the cushion. (I didn't have a staple gun and was too lazy to do anything else). 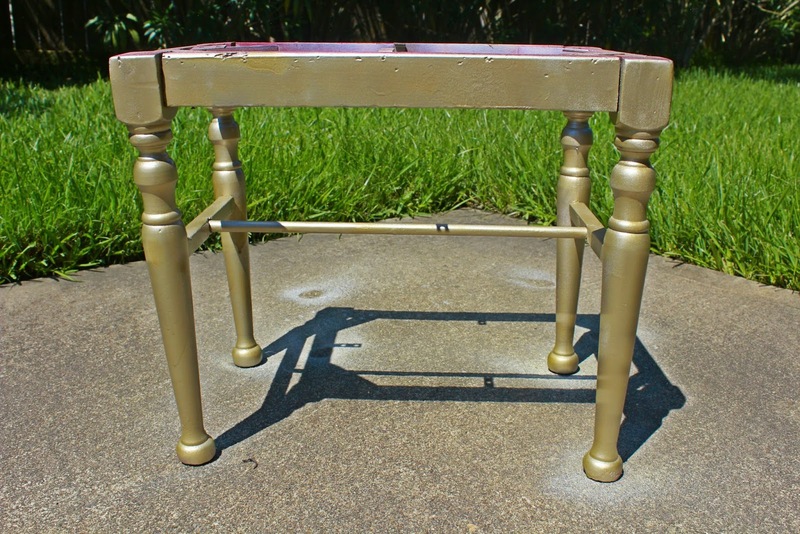 Then I took the stool part outside and spray painted it a champagne gold color. 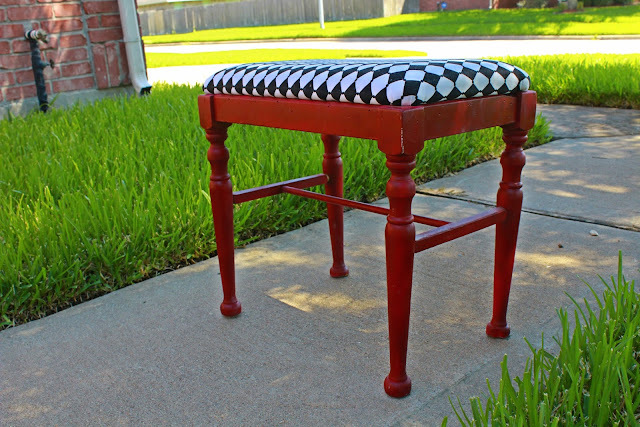 Finally I reattached the cushion and the stool. Much better. 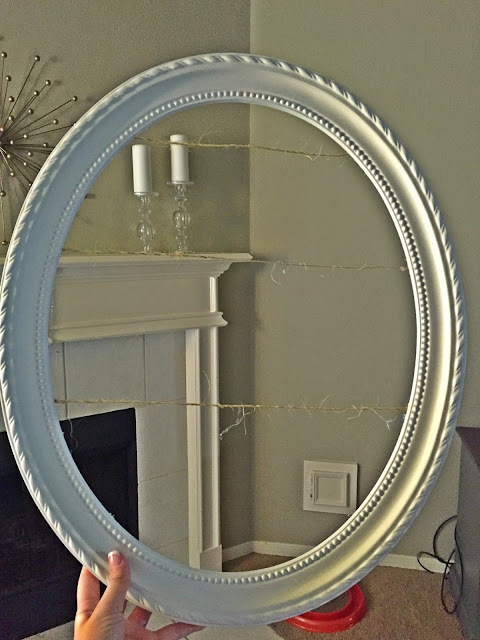 Now I just need a different mirror, which I plan to get from Home Goods soon, there is one I have my eye on. And my room will finally feel complete. I just love when Pinterest projects turn out great, don't you? Definitely gives you a feeling of accomplishment. Look at you being SUPER crafty!! 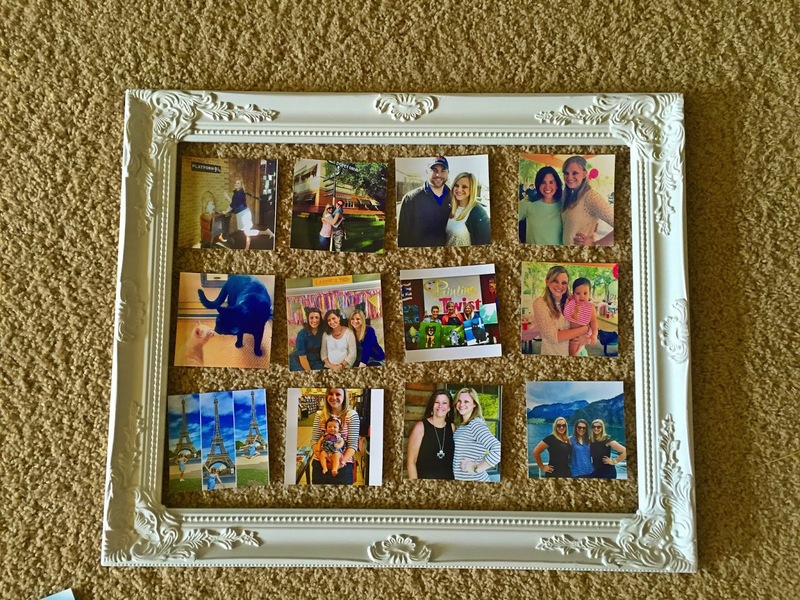 I still am in love with the frame photo hangers! These projects both came out SO nicely! 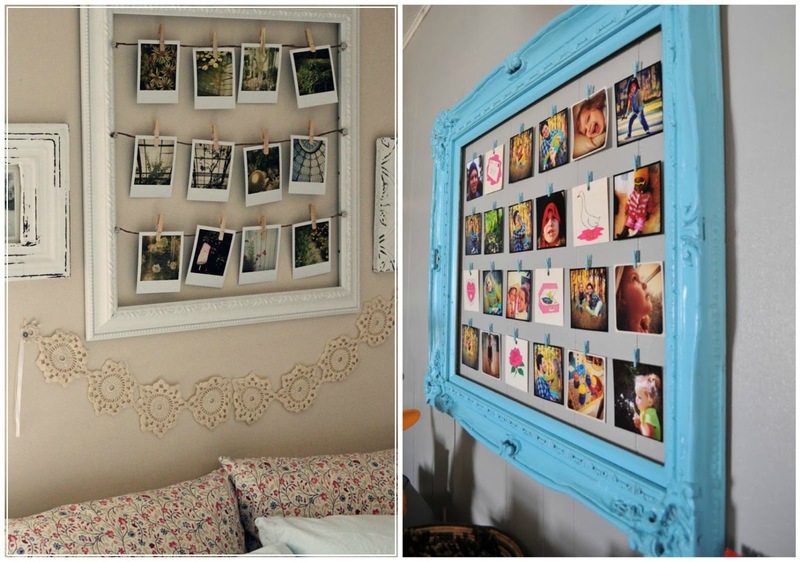 I really love the idea and look of that photo frame hanging! 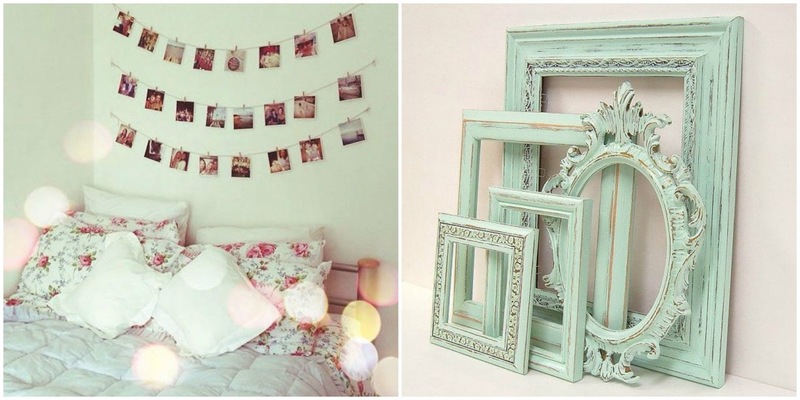 I'm totally going to make frames like these. 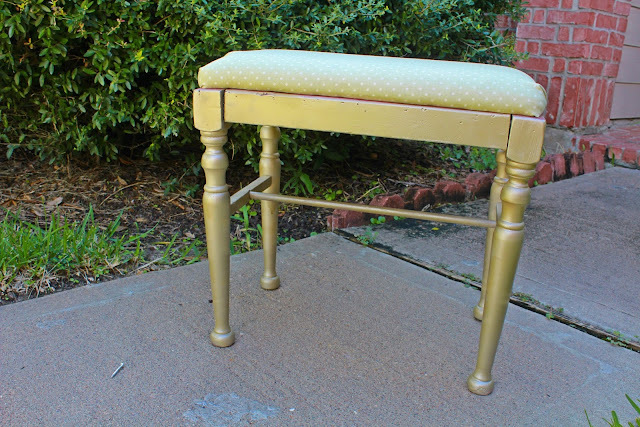 I have two little premade ones that are like this from Target but your's are so much cuter! The bench turned out great. Good job Kac!